The proportion of patients spending less than the four hours target time in hospital A&E departments in Wales is the lowest since records began. The percentage waiting more than 12 hours in A&E is also the highest, according to the health figures for February published Thursday. The 38,323 emergency calls to the ambulance service were also the second highest on record. But response times to "red" calls remained within the 65% target at 69%. The worsening performance figures in Wales is also reflected in other parts of the UK too. It is a sign also of the pressure NHS Wales has been under this winter, with increasing demand, including the worst flu season for several years. But these figures do not cover the very cold snap in early March. 75.9% of patients spent less than four hours in all emergency care facilities from arrival until admission, transfer or discharge, the lowest on record. This is 2.1% lower than the previous month and 5% lower than the same month in 2017. The target is 95%. 5,087 patients spent 12 hours or more in A&E, which is 21 patients fewer than in January - the record. But the proportion is the highest on record. The target is that no patients should wait this long. 85.3% of patients newly diagnosed with cancer via the urgent suspected route started treatment within the 62-day target time. The target is 95%. Overall, there were another 3,258 patients using A&E in Wales last month compared to February 2017. 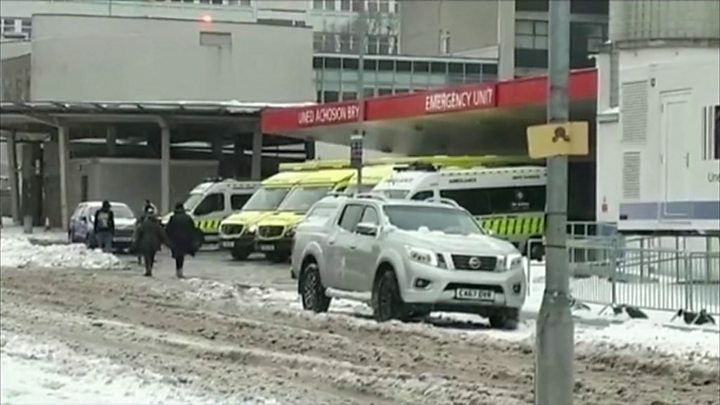 It was the busiest February on record for the University Hospital of Wales (UHW), the country's biggest hospital, with nearly 10,500 patients attending its A&E department. It was the second busiest February for Morriston in Swansea. Both hospitals saw rises in their 12-hour waits over the month. Dr Graham Shortland, medical director at UHW said bad weather and flu had compounded the pressures. "We want to free up ambulances as quickly and as appropriately as possible and I'd apologise to any members of the public who've been kept waiting in ambulances too long outside our hospitals," he said. "But I can reassure them, we at all times will clinically prioritise the needs of patients to come into the department to get the healthcare they require." Wrexham Maelor had the most patients waiting more than 12 hours, 738. And for the four-hour waiting times, it was also the worst performing with only 54.7% of patients seen within the target. Gary Doherty, chief executive of the Betsi Cadwaladr health board said he wanted to apologise and said it "wasn't the level of service we wanted to give or one we're proud of". But he said there had been bigger challenges than in the rest of Wales, especially with flu cases. Of the major hospitals, Prince Charles in Merthyr Tydfil saw 80.1% of patients within the four-hour target time and was the best performing. Health Secretary Vaughan Gething said the vast majority of patients had received "timely, professional care" but the figures confirmed it had proved "the busiest winter on record". He said none of the challenges were unique to Wales but the Welsh Government had provided an additional £10m in February to local authorities to enable people to remain in their homes or return from hospital to their community more quickly. NHS Confederation Wales director Vanessa Young said: "We've had excellent plans in place, probably the best ever but there's a particular set of circumstances this winter - the highest rate of flu since 2010/11, we've had sustained cold temperatures and we're seeing more people over 75 being admitted to hospital and often they have to stay longer." Conservative health spokeswoman Angela Burns called on Mr Gething to "get to grips with a mounting crisis on his watch". She added: "It's yet another sign of a health service under significant pressure, undermined by poor planning and underfunding by the Welsh Labour Government."